This morning I brought up LinkedIn.com in my browser, and what do I find? I've become an internet meme! 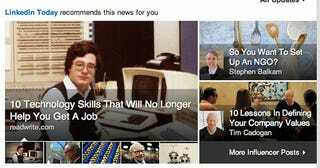 An article on obsolete technical skills that used a photograph of me circa 1978 from my Flick site was on the LinkedIn front page. Oh, and by the way: my skills as a systems programmer — which is the job I had on that IBM 360/65 mainframe in the background — continue to get me jobs. Engage the Ironic Drive, Mr. Crusher. Make it so!